The girls are growing so fast. 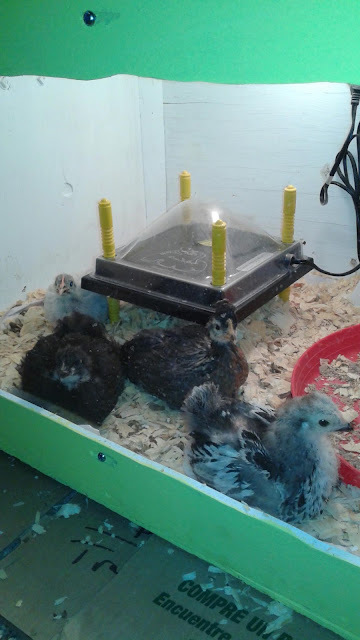 They have a roost now in the brooder and I've seen Queen Ann and Lillian using it. They are all scratching around like big chickens! When I have the brooder open, after they calm down from the lid being opened, they get real inquisitive about what is outside the brooder. A couple of them have made attempts to fly up to the edge but only Queen Ann has ever made it. I have almost completed getting my garden in. Just a few more things to plant, but of course my hoe broke before I could finish. At least all the live plants are. I should have that completed in the next couple days, then back to the chicken tractor construction. I feel down the steps last week. I got up in the night to use the loo and I was half asleep until I was abruptly wide awake screaming, sliding down the steps on my rear. I got a rug burn on my arm and a very bruised bum. We have a bathroom upstairs in the bedroom, but when I use it the light would wake up Jim and he would have a hard time falling back to sleep. Well my little tumble didn't even wake Jim up. We have a air purifier running to make noise. After I got back to bed, I must have been moaning and groaning as I was trying to get back to sleep because Jim woke up to ask what was wrong, I told him I fell down the steps. He asked if I was okay, I said I'm sore leave my alone. Well I now have a Glowbowl light that lights up the toilet so I don't have to turn on the light when I use it at night! I love it, it works great. That same night there must have been some commotion in front of our house. Jim called me in the morning to tell me to be careful when I pull out of the driveway because there was a bunch of broken plastic car parts all over the road and a dead deer laying in the ditch behind our mailboxes. Some one hit a deer, but didn't call the police. I figure they were probably drunk driving. Luckily a couple days later someone down the road came and took the deer away. Jim got poison ivy from all the debris he has been clearing out. He had cut a lot of dead trees and dead braches. We did find some poison ivy that is growing behind the garage, so he had sprayed that. There is an old metal fence that runs along the east side of the house. 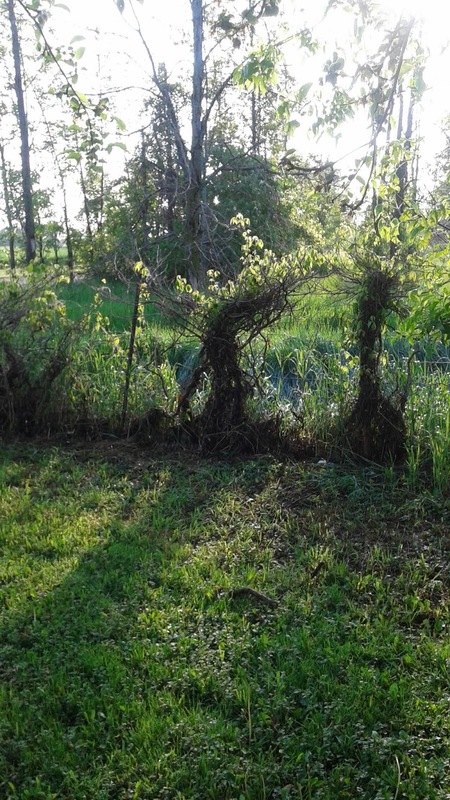 It has wild grapevine growing on it that looks nice. Jim had cleared a bunch overgrown stuff away from the fence in the front yard. There were these very cool looking vines that we thought we would keep along with the wild grapevine. Since Jim had already gotten poison ivy he was researching what it looked like so we could be sure to spot out when he is out working on the yard. So of course one of the pictures he finds is exactly like the cool vine we have all along the fence! We are going to need a tanker truck to help get rid of all this.